Caroline North off the Isle of Man was the station that hooked me on broadcasting and I owe her my career. Aged 11, inspired by the floating DJs, I built a bedroom ‘studio’ from old valve Dansette record players and Army surplus kit, recording embarrassing shows onto ¼” tape. The BBC trained me as a Studio Manager, specialising in sessions for shows like John Peel. I went into TV production, starting on Tomorrow’s World, and now direct documentaries including one recently called ‘Hey Mr. DJ’, celebrating the offshore era. I am married to Jan, who still has cassettes I made for her introducing my favourite tracks with personal messages! 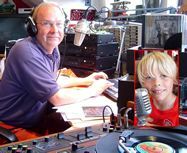 We have a young son, Matthew, who is a keen Liverpool football supporter and often pops in during my shows. Maybe he’ll be a DJ for the next generation.